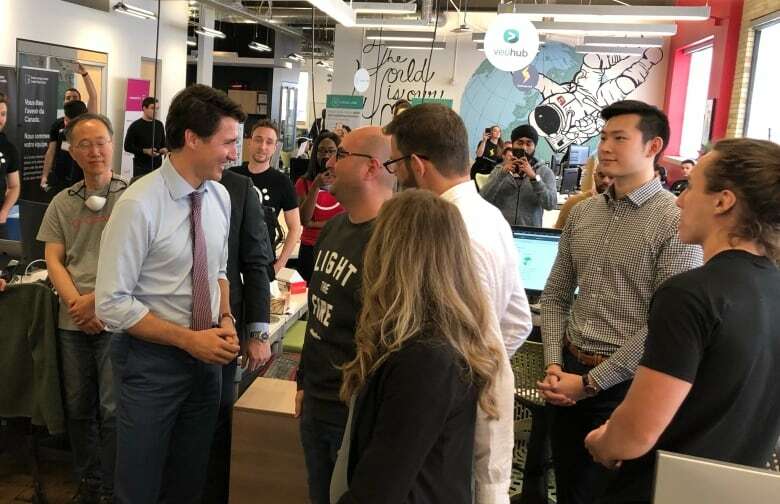 Prime Minister Justin Trudeau announced the funding for the new "Scale-up Platform" program for tech companies at the Communitech technology hub in Kitchener, Ont., on Tuesday. The federal government says the platform will be the first of its kind in Canada, and it will incorporate the skills of Ontario's "top innovation hubs": Communitech, in Kitchener, the MaRS Discovery District in Toronto and Invest Ottawa. The government said it expects the platform will help 30 Ontario companies, create 18,000 skilled jobs "and achieve revenues of $100 million or more by 2024." "For the first time in decades, we have a crop of scale-ready firms that are on the path to $100 million. Our job — through the Scale-up Platform — is to help those high-growth firms find the talent and capital to accelerate their growth," said Iain Klugman, President and CEO of Communitech. "We need to pool our expertise, our networks, and our resources to help them compete globally and create good-paying jobs for Canadians." JAN. 9: Justin Trudeau talks jobs, economy and pipeline expansion in Kamloops, B.C. Later Tuesday, Trudeau will host a community town hall in nearby Cambridge, Ont. The prime minister will be joined by four local Liberal MPs: Bardish Chagger of Waterloo, Raj Saini of Kitchener Centre, Marwan Tabbara of Kitchener South-Hespeler and Bryan May of Cambridge. A release, posted to the websites of all the local Liberal MPs involved says the town hall will discuss jobs, growing the economy and building a "stronger, more resilient middle class."